Governor Andrew Cuomo said he had no plans to close any roads, highways, subways or airports in a press conference held in Suffolk County early Thursday afternoon. He added that the MTA has no plans to shut the Long Island Rail Road because of the storm. Babylon Village Mayor Ralph Scordino said about nine trucks and two payloaders were plowing village streets Thursday morning. “We’re doing our main streets first and the parking lots next to the train station,” Scordino said. Scordino said all village offices were open as of Thursday morning. Suffolk County Executive Steve Bellone said Suffolk would get hit with the worst of the storm and urged drivers to stay off the roads at a news conference Thursday morning. He asked residents not to call 911 unless there’s a true emergency, he said at the Department of Public Works yard in Commack. “These are particularly dangerous conditions out there,” he said. The wintry mix that turned to wet snow will pack down, creating a layer of ice in places. Combined with wind gusts of up to 50 miles per hour, “those are conditions it’s just not possible to be driving in,” he said. He asked drivers to stay off roads to allow the county’s fleet of plows to operate. No decision has been made to close the Long Island Expressway, though it was discussed with Gov. Andrew M. Cuomo’s staff Thursday morning. “It’s always something discussed and thought about when you have this kind of accumulation this quickly,” he said. Police Commissioner Timothy Sini said police were responding to 18 car crashes and call volume was slightly higher than normal as of Thursday morning. Sini also urged drivers to stay off roads. “These roads are bad and are only going to get worst,” he said. Residents with non-emergency calls can dial (631) 852-2677 (COPS). Bellone said Suffolk bus operations were suspended Thursday with hopes of restarting them Friday, though it’s still uncertain. Rockville Centre Mayor Francis X. Murray, whose village plows its own roads, said he’s requiring that all parked vehicles be moved from the roads. “We want cars off the streets,” he said. Murray, a firefighter, said he was not aware of any motor-vehicle crashes. There didn’t seem to be many drivers on the roads this morning, he said. If the blizzard turns into an extended emergency, village vehicles can gas up at their fuel depot, which has 10,000 gallons of gas and 10,000 gallons of diesel, he said. Hempstead Village crews pretreated the roads with salt and beet brine overnight, said Mayor Wayne Hall Sr. Plows are working to keep the roads clear and will plowing curb-to-curb once the snow stops falling, he said. “Hopefully people decide to stay off the roads and just take a day off,” he said. Most people seemed to heed the warnings, and traffic was light this morning, Hall said. The mayor said he can’t complain about this blizzard because it’s been a warm winter. Mother Nature gave Long Island high temperatures on Wednesday, he said. “She teased us with spring and she wants us to come back to reality with winter,” he joked. Weather watchers can help be the eyes of the National Weather Service during Thursday’s huge storm on Long Island — and the information gathered can aid future forecasts. Snowfall amounts can vary over a small area, so the more information that can be recorded, the better, officials say. Find a flat, open area away from trees and buildings. Using a ruler or yardstick, take several measurements and average them. Report your average snowfall total to the nearest 10th of an inch. Make sure to include your include your location and the time of the measurement. Social media: Post a report on the weather service’s Facebook page (NWSNewYorkNY) or Tweet a report to the service (@NWSNewYorkNY). Sending a related picture is encouraged. If you’re a SKYWARN Spotter: Call the 800-number on your spotter card, or share with the weather service via social media. Make sure to identify yourself as a spotter. All New York area Capital One bank branches, including those on Long Island, are closed Thursday, Feb. 9, due to the winter storm, company officials announced. Customers still have the option of using online banking and ATMs. Updates can be found in the bank's online newsroom here. Crews in Glen Cove began salting streets at 3 a.m. and plowing at 7:30 a.m., public works director James Byrne said. Roughly 3 inches of snow had fallen in the city by 8 a.m., he said. “The problem is the temperature is dropping now and there’s icing on the roads,” he said. “We’re starting to see skidding conditions.” Byrne said there are fewer drivers than usual for the morning rush hour. “We recommend people stay off the roads,” he said. City crews likely will make two to three passes throughout the city. First, they’ll plow the main roads and then hit the least busy streets, Byrne said. After the snowfall ends, crews are expected to work another eight to 10 hours for a final plow that will expose the street’s surface, which will then be salted to prevent icing. The city is using 23 trucks with plows, as well as smaller vehicles for narrow streets and parking lots, he said. The city likely will use nearly 200 tons of salt today, Byrne said. Garbage and recycling pickup was canceled so city employees could focus on snow removal. City officials in Long Beach declared a snow emergency at 6 a.m., as city crews began to plow streets. City workers were focusing on clearing main thoroughfares for commuters in the Long Island Rail Road parking lot and along Park Avenue, Broadway and West Beech Street. Sanitation crews were collecting garbage, the city’s bus service was operating, and City Hall remained open. The city canceled all recreation programs, and the Long Beach Recreation Center was scheduled to close at noon. The city also canceled senior programs, day care and before- and after-school activities. Suffolk County Transit canceled all bus service Thursday ahead of the storm. “We are hopeful to resume operations tomorrow, but that will be a decision we make as we go forward,” Suffolk County Executive Steve Bellone said during a Thursday morning news conference. State Police said there was one minor injury when a car overturned on the Robert Moses Causeway just south of Sunrise Highway about at 7 a.m. Thursday. Freeport Mayor Robert Kennedy said snow removal crews have been out since 3 a.m. sanding the streets and preparing for the storm. He urged residents to park their cars in municipal lots, where parking regulations have been suspended, so the plows can go down streets more easily - particularly on the village's south side, where the roads are narrow. About 40 trucks are patrolling the village and clearing streets, he said. The fire, electric and water departments are all on standby. The fire and police departments responded to a few car accidents Thursday morning but none had critical injuries, Kennedy said. As 1 to 3 inches of snow is falling an hour, "it looks like we didn't plow an hour after we went through," he said. Oyster Bay Supervisor Joseph Saladino said there is a “priority management operation in place” that means the town’s morning garbage collection that was underway early Thursday morning has been suspended to allow crews to help with the snow cleanup. “We’ve shifted from morning sanitation pickup to a full snow plowing operation,” Saladino told News 12 Long Island. Saladino asked residents and business owners to retrieve garbage containers that had been placed outside but were not emptied during the morning pickup so that they don’t hamper snow removal. On Monday the regular garbage pickup schedule was expected to resume, Saladino said. Hempstead Town has used its new beet brine system for the first time for Thursday’s storm. Snow removal crews are clearing roads and their priority is clearing Long Island Rail Road commuter parking lots in town, according to spokesman Mike Deery. The town's garbage and recycling services have been canceled, as well as the senior citizen ID, enrichment and transportation programs, according to a town news release. The Town Clerk's Office will close at 4:45 p.m. Thursday, the release said. A Winter Storm Emergency has been declared in Riverhead Town to facilitate snow removal from the roads. All motorists are required to remove their vehicles from the street to allow for snowplowing operations; any parked or abandoned vehicles that affect the roadway cleanup during the storm will be impounded by Riverhead police, officials said. Town Hall and the Justice Court will also be closed Thursday, and garbage collection has started an hour earlier than normal. Residents and business owners are asked not to shovel snow into the street as it creates a hazard for their neighbors and motorists. Courts in Nassau and Suffolk counties will be closed Thursday, except for the arraignment parts in District Court, according to the New York State Courts website. The Court of Claims in Hauppauge is also closed. For more information, visit the state court website here. 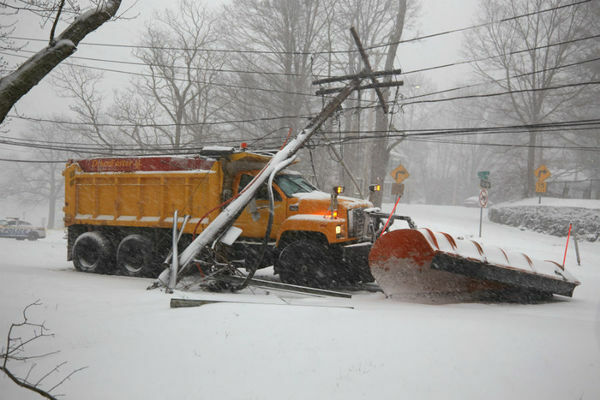 Route 25A/Main Street is closed in Huntington between New York Avenue and Nassau Road after a plow truck struck a utility pole, knocking down wires at 6:05 a.m. Thursday, Suffolk County police said. The state Department of Transportation reported a crash involving several vehicles on westbound Sunrise Highway approaching Exit 43 at 6:06 a.m. Thursday.